It's amusing to realize that this tiny aromatic evergreen is technically a shrub. It can be used as a bonsai tree for beginners who don't know how to bonsai, since it would need no training as such. It is a scant four to six inches tall. It spreads only about four inches annually, by stolons, or new plants erupt from animal-despersed seeds. Over time it becomes a pleasing ground cover. The two plants shown in the first photo have filbert leaves naturally mulching the ground around them, as they grow in the shade of a corkscrew filbert. Wintergreen (Gaultheria procumbens ) is related to the Northwest native evergreen groundcover Salal which was used by Quinault & Klallum Indians for its medicinal properties. 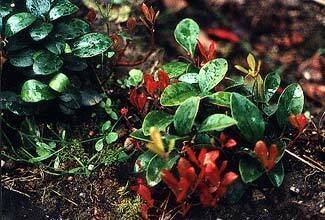 Like salal, wintergreen does well in sun or shade, but prefers partial shade & acidic soil. This is a great little plant for Northwest gardens as well as in its native Northeast range. The bright red berries develop in early Autumn & last through the winter all the way to the following summer, when finally displaced by pale dangling flowers that start the year-round decorativeness anew. It frequently blooms twice a year, in spring then again toward summer's end or autumn, so that sometimes it has ripe berries, green berries, & blooms on it all at the same time. The top mid-December portrait conveys why they are sometimes burdened with the name "Christmas Wintergreen." The second portrait was taken early in March & the third in May, showing bright red new leaf growth. The fourth shot of the white flowers was taken in September, during its second bloom for the year. It took two full years for this stuff to start spreading. At the start of these wee shrubs' third spring in the ground, little starts of new wintergreens began to appear inches to a foot away from the parent plants. It can take four years in ideal conditions to become a dense groundcover. We planted perhaps a dozen pots of it, four of which were gallon-sized the rest little four-inch pots, & not until the fourth year was it ever necessary to pull even a little of it up for having invaded nearby areas where it isn't needed. The Ojibwa Indians called it Winisbugons (usually translated "Dirty Leaf" but perhaps better translated "Leaf in the Bog"). The French in Quebec gave it the poetic name la Petit te du bois, "The Little Tea of the Woods." Throughout its extensive range it has won a number of regional names: Box Berry, Canadian Mint, Checkerberry, Deerberry, Leatherleaf, Ground-tea or Groundberry, Hillberry, Mountainberry, Patridgeberry, Spiceberry, Teaberry, Wax Cluster, & other names. The berries provide winter food for squirrels, chipmunks, deermice, grouse, partridges, bobwhites, turkeys, & is even eaten by the red fox in emergency. The leaves as well as the berries are liked by deer & bears. The berries are edible for people too. Though I do occasionally pluck one to pop in my mouth while gardening, we by & large don't harvest ours because they feel more valuable just decorating the garden; the flavor is bland, tasting only faintly of wintergreen. Native Americans taught the first white immigrants to use the leaves medicinally; it is a far more authentic home-remedy than most herbals, containing the same methyl salicylates that are in asprin. 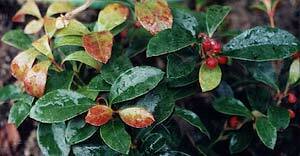 Wintergreen was once famous as a native tea hence the regional name Teaberry, but it has fallen out of use because people have forgotten how to prepare it. The leaves can be harvested at any time of year, but have to be fermented if they are to have any taste beyond just a pleasant odor. To prepare the leaves, pack a jar with them, fill with sterile water, & set the sealed jar in a warm spot for several days, until the water becomes bubbly with fermentation. The first soaking of water makes a strong tea when heated & diluted to taste; or the flavored water can be used in cooking or to add a distinctive flavor to lemonaid or pecoe tea. The fermented leaves themselves are strained & placed in a dehydrator or permited to dry out naturally if it is a low-humidity season. The dried leaves can later be prepared in boiling water like any other tea, making a milder brew than the water from the original fermenting.